Gecko Press in New Zealand plays a phenomenal role in discovering, and then making accessible, outstanding children’s books from around the world. Their 2016 publications are from countries as diverse as Sweden, Mexico, Japan and Portugal. 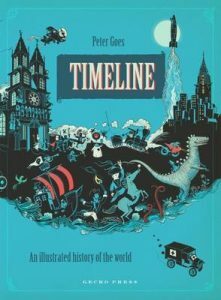 One of the most impressive books I’ve seen for a long time is Timeline: A Visual History of Our World by Peter Goes (Belgium). It is appropriately oversized and I felt a frisson of recollection and excitement when I opened many of the pages, remembering my first encounters with aspects of ancient history all over again. Beginning life, dinosaurs, first people and settlements merge into fascinating cameos of Mesopotamia, Egypt, Greece, Rome and the Byzantine Empire. Ottoman, Chinese, Inca and North American histories are also covered. Modern history and world wars bring us to the present day. Australia’s claim to fame is the band ACDC. France-based Stephanie Blake returns with the bold, bright colours and clear lines of her popular rabbit, Simon in Super Rabbit. Portugal shines with Isabel Minhos Martins and Bernardo P. Carvalho’s Don’t Cross the Line! 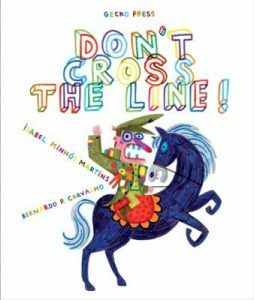 This is an exceptional, innovative postmodern (mainly) visual representation of people who aren’t allowed to cross the line onto the next page due to a pointless rule. It is a telling fable. What Dog Knows is a cleverly constructed mixture of fact and fiction by Sylvia Vanden Heede and Marije Tolman from the Netherlands, translated by Bill Nagelkerke. It is structured into four sections: Mummies and skeletons; Robots, knights and pirates; Dinosaurs and dragons; and Rockets and the moon. The delightfully flawed but kind, Detective Gordon, a cake-loving frog, returns in Swedish creators Ulf Nilsson and Gitte Spee’s A Complicated Case. As we are reminded in the detective’s Book of Law, ‘It is permitted to be nice but forbidden to be nasty’. 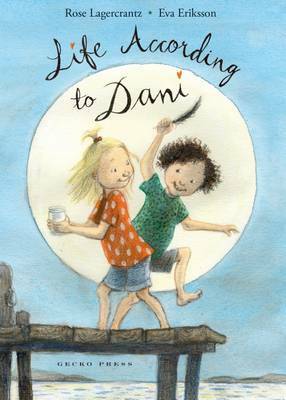 Also from Sweden is the poignant story of Dani in Life According to Dani by Rose Lagercrantz and Eva Eriksson, both highly awarded children’s book creators. This chapter book continues Dani’s realistic life, here dealing with her response to her father’s new girlfriend. From Mexico is Paula Bossio’s board book, The Pencil (also called The Line). Deliberate smudges create texture and dimension alongside the fascinating pencil line followed by a young girl. Yours Sincerely, Giraffe is a heartwarming, yet edgy tale of new friendships from Japan by Megumi Iwasa and Jun Takabatake. It’s unpredictable yet highly satisfying. And we finish in Israel with Michal Shalev’s hilarious How to Be Famous. 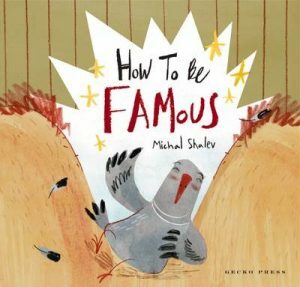 The pigeon is completely oblivious to her true level of fame. Thanks for making these astounding books available to a wide readership, Gecko Books. A buzz has been building about Australian author Mark Henshaw’s long awaited second novel after Out of the Line of Fire. The Snow Kimono (Text) is a literary psychological thriller set in Japan and France. Insights into both those countries shape the contours, ridges and atmosphere of the novel. Paris is wet and snowy and its streets and iconic buildings are lit with fireworks and the elements. Japan is elusive and mystical, with bamboo, bridges over water and the sounds of frogs, the slow tock, tock, tock of the water clock, the strings of a shamisen in a night garden. It is also a place of snow, birthing the snow kimono. A retired French police inspector, Auguste Jovert, receives a letter, has an accident and meets Tadashi Omura, a former lawyer from Japan. Omura begins the story of Fumika, the girl he pretended was his daughter and, over the course of the novel, relates the story of his inconceivable life. Japan, and some of its secrets, is vividly revealed to us through a Parisian prism. Jigsaw puzzles are a tantalising symbol. Omura’s father loved the ancient tradition of jigsaws where each piece is unique and designed to deceive – to make the puzzle more difficult. He owned rare, antique puzzles made from exotic wood with inlays of precious materials. The best had infinite or contradictory solutions. Omura explains, In our tradition, how a puzzle is made, and how it is solved, reveals some greater truth about the world… Puzzles are objects of contemplation. The lie behind Omura’s life unfolds like the exquisite mirror-scope that he constructs for Fumika to see the flying kites. 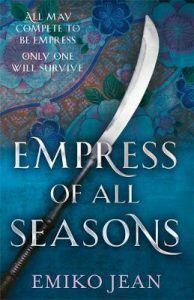 We learn of his brilliant, devious friend, Katsuo who is about to be released from prison and whose past life shadowed Omura’s own. Katsuo is an author who mimicked his friends’ and acquaintances’ mannerisms, almost imprinting them onto himself, as well as conjoining them into his writing. He demanded stories be told to him again and again, craved power over people and displayed controlled patience. The kimono is an alluring motif. 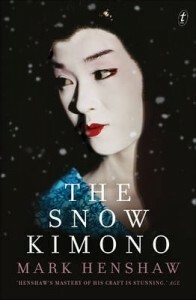 The snow kimono was made by Sachiko’s grandmother and becomes hers when she moves to inscrutable Mr Ishiguro’s house. She is one of a number of characters who feature in the story. The clever narrative is structured into parts, showcasing major characters such as Jovert, Omura and Katsuo, as well as the females whose lives intertwine with theirs – Sachiko, Fumika, Natsumi, Mariko and Martine. 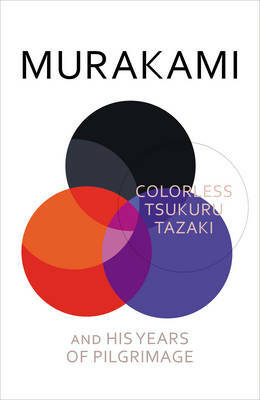 I would highly recommend The Snow Kimono to readers of Haruki Murakami’s style of literary fiction. It is likely to appear on upcoming Australian award shortlists. My obsession with David Mitchell continues and is getting more intense. There are books you devour. There are books you savour and never want to end. And then there are David Mitchell books which are both. I went with The Thousand Autumns of Jacob De Zoet because there was a reference and crossover with The Bone Clocks. It is the most linear chronologically of David Mitchell that I have read so far but in no means does this curb his imaginative scope. It is a love story, a historical novel of the highest class, it is a Japanese story of intrigue, honour and betrayal. It is quietly simply one of the most beautifully books I have ever read. Set at the turn of the 19th century in Nagasaki the book focuses on a Dutch East Indies trading outpost, Dejima. Foreigners are not allowed on Japanese soil so the Dutch instead have created an artificial island from which they are allowed to trade. Jacob De Zoet is a new arrival tasked with the inevitable job of cleaning up the outpost’s highly corrupted books. De Zoet becomes not only enchanted and intrigued by the tightly closed and controlled feudal Japanese society but also a young midwife who is determined to learn the best of Dutch and European medical practices. David Mitchell plots his story magnificently. Slowly placing all his pieces on his rich board before scattering things in ways only his imagination could conjuror. Rich in historical detail, deep in cultural complexities and with the perfect mix of tragedy and intrigue. David Mitchell is an absolute genius and I have to read everything he has written. This is one of those great novels that blends up truth and imagination so well that the lines between fact and fiction are so blurred you don’t even know where to begin trying to unravel it. It also doubles the intrigue especially the way Jesse Ball structures the story to unfurl piece by piece, layer by layer in such a way you are taken by surprise after surprise. The story concerns the “Narito Disappearances”. A crime that baffled local authorities in Osaka where eight people had gone missing seemingly without a trace until one day a signed confession is handed in to police. The man who has made the confession is quickly arrested and doesn’t say another word. But this is not a whodunit because as the story goes on we see there is a much bigger and more important question that who. One one level this is an ingenious crime novel. By telling the story in a different order the facts and “truth” aren’t revealed to us until we get to the beginning of the story. Rather than telling the story in chronological order we follow the path Jesse Ball’s investigation follows like a trail of breadcrumbs. Ball recounts his investigation through interview transcripts and internal notes as well as letters and other documents he is given along the way. Each interview shines a little more light onto the story and leads Jesse to another piece of the puzzle. I was so engrossed in this book it wasn’t until finishing it that I truly digested what I had read. In many ways this is a modern parable about the moral fallacies we place on our systems of justice but the skill and subtlety in which Jesse Ball tells the story gives it not just power but also emotional resonance. And by doing so Jesse Ball gets to the absolute core of what a crime story is and what it should mean when we read one. Launch of new series: What Is It? I’d like to introduce a new series of posts I’m going to be writing called: What Is It? I’ll be exploring topics related to the world of books and reading as well as taking suggestions from you. To kick things off, I’ve decided the first topic in this new series is going to be haiku. Haiku is a mystery to many devotees of the written word – myself included – so, I’ve gone out into the world to learn more about the mysteriously clever art of haiku and share my findings with you. 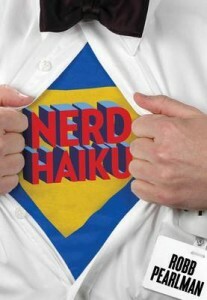 Now that you know a little bit more about what a haiku is, the next step is probably reading some existing work. 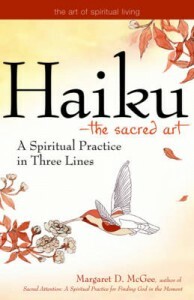 A good place to start is by reading Haiku – The Sacred Art: A Spiritual Practice in Three Lines by Margaret D. McGee (pictured above). 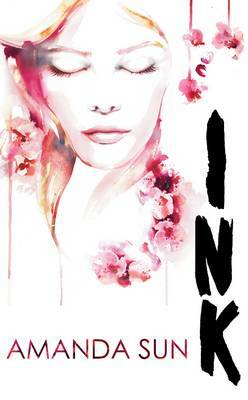 Another book to consider is Haiku Mind – 108 Poems to Cultivate Awareness and Open Your Heart by Patricia Donegan. 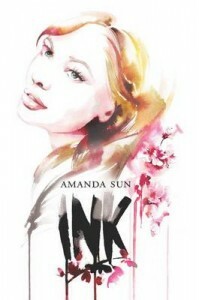 It’s a collection of haiku poems with themes such as honesty, transience and compassion and has a wonderful calming cover just begging the reader to dive in. If you’ve been inspired by reading some haiku by other authors and feel ready to try your hand at writing one yourself, then Writing and Enjoying Haiku: a Hands-On Guide by Jane Reichhold seems like a good a place as any to start. You’ll read how haiku can bring a: “centered, calming atmosphere into one’s life, by focusing on the outer realities of life instead of the naggings of the inner mind.” Sounds perfect doesn’t it? Hopefully this new series will cover some interesting topics and inspire you to explore new areas in literature. Suggestions are very welcome, so please comment below and tell us what you’d like to know more about in the great world of books. 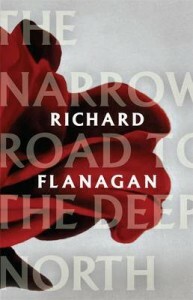 Richard Flanagan has been working on this novel for over 12 years, writing other novels in between. He’d gone through countless drafts, reworked the story, started completely over. The reason it troubled him so much was because central to the story are the Australian POWs who worked on the Thai-Burma death railway. An experience shared by his father. He didn’t just want to get the story right, he had to get the story right. And I believe, deep down in my guts, in my heart and with every fibre of my being that he has got the story right.